Bike Walk Lincoln Park: Do you know the laws for drivers and bicyclists in Chicago? Do you know the laws for drivers and bicyclists in Chicago? 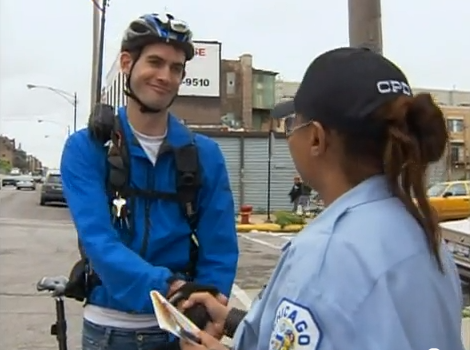 The Chicago Police Department has a great training video on YouTube about rights and responsibilities of bicyclists in Chicago, and about laws affecting drivers when interacting with bicyclists. Even if you think you already know the laws, as a driver or a bicyclist, I encourage you to take 14 minutes to watch "Traffic Enforcement for Bicyclist Safety", because you may learn something. I know I did. For those of you who want to skim instead, here's my Cliff Notes version. First, they run through motorists' responsibilities to bicyclists. 1/ MCC 9-40-160 "Drivers to exercise due care"
This ordinance requires that drivers must watch out for bicyclists and drive defensively around them, just as they're required to for any other road user. 2/ MCC 9-16-020 (f) "Improper right turn in front of a bicycle"
It's illegal for a driver to make a right turn in front of a bicyclist, just like it is illegal to do so in front of a bus. That's the first thing I learned: I always thought this was just rude behavior, but it turns out it's illegal. 3/ MCC 9-16-020 (e) "Yield right-of-way to a bicycle on left turn"
A driver waiting to turn left must also wait for bicyclists to clear (in addition to car traffic) before completing their turn. Illinois' required three-feet passing distance is nicely illustrated in this screen shot from the Chicago Police Department's police training video, "Traffic Enforcement for Bicyclist Safety". 4/ MCC 9-36-010(c) "Overtaking bicyclists at unsafe distance"
It's has been Illinois state law since 2007 that a driver must leave three feet of space while passing a bicyclist. This means that if there isn't enough room, the driver must wait until there is enough room, not squeeze through. This law is not news to me, but the lack of compliance with the law is one of the worst things about riding in the city. I'm regularly "buzzed" by vehicles passing less than 18 inches from me. When they do this going 35-40 mph (on Madison Street in the Loop, or on Dearborn Street, when I'm in the bike lane that runs on the left side of the street, or on Clark Street in Lincoln Park north of North Avenue) it's pretty terrifying, and it's not that uncommon. On the video, a bicycling cop describes how "It's very nerve-rattling when a car passes you with six inches, and you're on a bike." If I could magically make all drivers aware of one law regarding bicyclists, I would pick this one. Well, since I'm wishing for things, I would magically make them FOLLOW this law. Well, why not magically have them follow ALL bicyclist-related laws? But I digress. 5/ MCC 9-80-035 "Open door in traffic"
Drivers must check for traffic coming from behind before opening their door, and failing to see a bicyclist approaching can cause a crash. Even if the bicyclist doesn't collide with the door, the opening of the door may cause them to swerve, and cause a crash. If this happens, the driver who opened the door is legally responsible. Bicyclists call this type of incident a "dooring". The violation of this law is what caused the recent death of Neill Townsend, who died on Wells Street last week when a motorist opened his door into the bike lane, causing Neill to swerve into the path of a truck. The motorist undoubtedly didn't mean to cause any harm just while doing something as mundane as opening his car door, but unfortunately, he did, and doorings like this happen all the time. WBEZ created a map of where doorings were reported between 2009 and 2012. There were 577 doorings reported during that time, so that's about one dooring reported every other day. Even if they don't result in death, they can result in everything from scrapes, fractures and property damage, to life-changing injuries. So, this is another very important ordinance and issue that I wish more drivers were aware of. 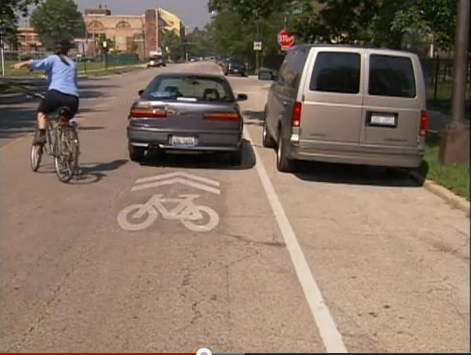 This section of the video shows how a car parked in a marked shared lane forces the bicyclist to merge with faster moving traffic. 6/ MCC 9-40-060 "Drive/park vehicle on bike lane/path, marked shared lane"
The video then goes on to describe three Illinois vehicle code sections that establish certain rights for bicyclists. Bicyclists are allowed to take the entire lane when they need to in order to avoid obstacles, or when there's not enough room for vehicles to pass them. Bicyclists are allowed to use the left lane on a multi-lane one-way street. Bicyclists are allowed to use the left lane to make a left turn (just like a motor vehicle does). Must yield to pedestrians in crosswalks. Must not ride on the sidewalks (12 years and older). Ride predictably and follow the rules of the road. Let's all make an effort to know the laws and to follow them, whether we're on the street as a bicyclist or driver! Wishing you safe travels. Nice video--hope CPD uses it! ;-). Also nice summary, and the entire post was quite useful. Thanks. Are these laws taught at all in drivers' education classes? My bet would be no. These laws really need to be enforced and motorists need to be made aware of them. Perhaps adding them to a license renewal exam? In my 30 minute commute home from work, I witness anywhere from 10 to 20 violations, mostly driving/stopping in the bike lane, and not allowing 3 feet of passing space. This kind of behavior is unacceptable. It's far too widespread, and needs to be enforced.